James Lum, Matthew Greene, and Hunter Hopcroft own JM Stock Provisions, a whole-animal butchery in Charlottesville and Richmond, VA. JM Stock is dedicated to sourcing high-quality, sustainably raised meats from close to home, and has been working closely with their farmers since opening in 2013. In addition to wide selection of beef, pork, chicken, and lamb cuts, JM Stock offers housemade sausages, bacons, deli meats, and terrines, as well as broths and soups. Both locations also stock a curated selection of pantry items, prepared foods, beer, wine, and fine artisan cheese from around the globe. 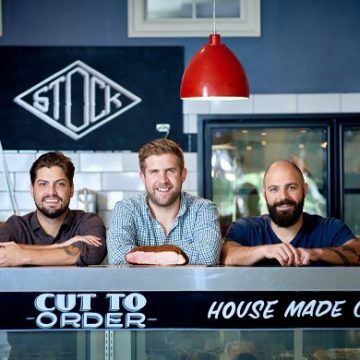 JM Stock Provisions has been awarded three Good Food Awards: in 2017 for their Beef Tongue Pastrami, in 2016 for their Tasso Ham, and first won in 2015 for their Paté de Campagne. Prior to opening JM Stock, Lum and Greene worked together at Brooklyn’s The Meat Hook. During their time in New York, their passion for sustainable food intensified, and they honed their skills in butchery. Charlottesville’s vibrant food community, support for local farming, and consumer attention to craftsmanship made for an ideal location to open the first JM Stock Provisions shop in October 2013. The pair partnered with Hopcroft to expand JM Stock into the Richmond area, opening in The Fan in January 2015.